Gases in compressed form serve countless indispensable roles in modern technology. Oxygen is used extensively to produce stronger and cheaper steels. Acetylene welding and brazing of certain metals has been common for many years. Other compressed, flammable gases such as hydrogen are equally necessary for the welding of certain metals. Some metals and alloys (such as stainless steel, titanium, and zirconium) can be welded only under an inert gas atmosphere. Carbon dioxide is used extensively in fire extinguishers for chemical and electrical fires. Propane and butane are used for heating components or spaces. If the contained substance is flammable, 25 psig at 100°F. This simplified definition and the range of boiling points among gases classify gases into two major groups that differ in physical state when contained. Non-liquefied gases, which are gases that do not liquefy in containers at ambient temperatures and under pressures attained in commercially used containers that range to 2,000 to 2,500 psig. Liquefied gases, which are gases that do become liquids to a very large extent in containers at ordinary ambient temperatures and at pressures from 25 to2500 psig. The first group, commonly called non-liquefied gases, has relatively low boiling points, approximately -150°F or lower. Non-liquefied gases do, however, become liquids if cooled to temperatures below their boiling points. Those that liquefy at “cryogenic” temperatures (from absolute zero -459.7°F to around -240°F) are known as cryogenic fluids. The second group, or liquefied gases, has boiling points relatively near atmospheric temperatures (from about -130°F to 30°F). The liquefied gases solidify at cryogenic temperatures. Oxygen, helium and nitrogen are examples of gases in wide use both as non-liquefied gases and cryogenic fluids. With respective boiling points of -297°F, -425°F, and -320°F, they are charged into high-pressure steel cylinders at more than 2,000 psig at 70°F for shipment and used as non-liquefied gases. 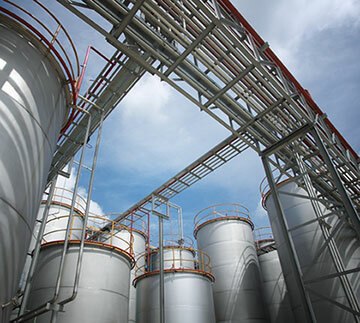 However, when shipped as cryogenic fluids, they are cooled down to liquid form and charged into special insulated containers that keep them below their boiling points and contained at pressures normally less than 75 psig. A third physical state in the container is represented by only one widely used gas, acetylene. Acetylene is sometimes referred to as a dissolved gas. A dissolved gas is defined as a gas that is dissolved into a solution. The industry recommends that free acetylene should not ordinarily be handled at pressures greater than 15 psig because, if handled at higher pressures without special equipment, it can decompose with explosive violence. Consequently, acetylene cylinders are packed with an inert porous material that is saturated with acetone. Acetylene charged into the cylinder dissolves in the acetone and in solution will not decompose at or below the maximum authorized shipping pressure of 250 psig at 70°F. Compressed or liquefied gases are also often described according to loosely knit families to which they belong through common origins, properties, or uses. The major families of gases are atmospheric gases, fuel gases, refrigerant gases, aerosol gases, and poison gases. Atmospheric gases comprise one family. Its most abundant member is nitrogen, constituting 78 percent of air by volume; oxygen, constituting 21 percent of air by volume, is its second most abundant member. Most of the remaining 1 percent of the atmosphere consists of a sub-family of gases, the inert gases, which share the property of chemical inertness. Inert gases are chiefly argon, with minute quantities of helium, neon, krypton, xenon, and radon. The last four are frequently called the rare gases due to their scarcity. Hydrogen also occurs minutely in the atmosphere, as do a large variety of trace constituents, small amounts of carbon dioxide, and large amounts of water vapor. Another family of gases is the fuel gases, which are burned in air or with oxygen to produce heat and make up a large family related through their major use. Its members are notably the hydrocarbons including liquefied petroleum (LP) gases, propane, butane, methane, and welding gases such as acetylene and hydrogen. An opposite application relates members of another large family, the refrigerant gases. A refrigerant gas liquefies easily under pressure and works by being compressed to a liquid which then absorbs large amounts of heat as it circulates through coils where it vaporizes back into gaseous form. Examples of refrigerant gases include ammonia and the fluorocarbons (freon). Aerosol propellant gases make up a family also related by use through the introduction of pressure-packaged products used in the form of a spray or foam. Propellant gases have moderate vapor pressures at room temperatures (70 psig down to 35 psig, and even lower in some cases). It is usually agreed that a good propellant should also be nontoxic, chemically stable, noncorrosive, and inexpensive. The fluorocarbons (freon) and nitrous oxide are the most commonly used propellant gases. Gases considered to be members of the poison gas family are generally those that the ICC has classified as poison gases to ensure public safety in interstate shipments. Two examples of these gases are hydrogen cyanide and phosgene. Compressed and liquefied gases are widely useful due to properties including high heat output in combustion for some gases, high reactivity in chemical processing with other gases, extremely low temperatures available from some gases, and the economy of handling them all in compact form at high pressure or low temperature. These same properties, however, also represent hazards if the gases are not handled with full knowledge and care. Practically all gases can act as simple asphyxiates by displacing the oxygen in air. The chief precaution taken against this potential hazard is adequate ventilation of all enclosed areas in which unsafe concentrations may build up. A second precaution is to avoid entering unventilated areas that might contain high concentrations of gas without first putting on a breathing apparatus with a self-contained or hose-line air supply. A number of gases have characteristic odors which can warn of their presence in air. Others, however, like the atmospheric gases, have no odor or color. Warning labels are required for compressed and liquefied gas shipping containers. Similar warning signs are placed at the approaches to areas in which the gases are regularly stored and used. Some gases can also have a toxic effect on the human system, either inhalation through high vapor concentrations or by liquefied gas coming in contact with the skin or the eyes. Adequate ventilation of enclosed areas serves as the chief precaution against high concentrations of gas. In addition, for unusually toxic gases, automatic devices can be purchased or built to monitor the gas concentration constantly and set off alarms if the concentration approaches a danger point. Precautions against skin or eye contact with liquefied gases that are toxic or very cold, or both, include thorough knowledge and training for all personnel handling such gases, the development of proper procedures and equipment for handling them, and special protective clothing and equipment (for example, protective garments, gloves, and face shields). With flammable gases, it is necessary to guard against the possibility of fire or explosion. Ventilation, in addition to safe procedures and equipment to detect possible leaks, represents a primary precaution against these hazards. If fire breaks out, a suitable fire extinguishing apparatus and preparation will limit damage. Care must also be taken to keep any flammable gas from reaching any source of ignition or heat (such as sparking electrical equipment, sparks struck by ordinary tools, boiler rooms, or open flames). Oxygen poses a combustible hazard of a special kind. Although oxygen does not ignite, it lowers the ignition point of flammable substances and greatly accelerates combustion. It should not be allowed closer than 10 feet to any flammable substance, including grease and oil, and should be stored no closer than 10 feet to cylinders or tanks containing flammable gases. Some liquefied gases require special precautions. For example, when liquid oxygen is handled, all combustible materials, especially oil or gases, should be kept away. Smoking or open flames should never be permitted where liquid oxygen is stored or handled. NO SMOKING signs should be posted conspicuously in such areas. Liquid oxygen, or oxygen-rich air atmospheres, should not come in contact with organic materials or flammable substances. Some organic materials (oil, asphalt, kerosene, cloth, or dirt containing oil or grease) react violently with oxygen, and may be ignited by a hot spark. Liquid oxygen may form mixtures that are shock sensitive with fuels, oils, or grease. If liquid oxygen spills on asphalt, or on another surface contaminated with combustibles (for example, oil-soaked concrete or gravel), no one should walk on and no equipment should pass over the area for at least 30 minutes after all frost or fog has disappeared. Any clothing that has been splashed or soaked with liquid oxygen, or exposed to a high gaseous-oxygen atmosphere, should be changed immediately. The contaminated systems should be aired for at least an hour so that they are completely free of excess oxygen. Workers exposed to high-oxygen atmospheres should leave the area and avoid all sources of ignition until the clothing and the exposed area have been completely ventilated. Clothing saturated with oxygen is readily ignitable and will burn vigorously. For more detailed information on Safely Working with Chemicals and Gases, visit our free Industrial Wiki or contact us at sales@techtransfer.com to set-up a class at your facility.